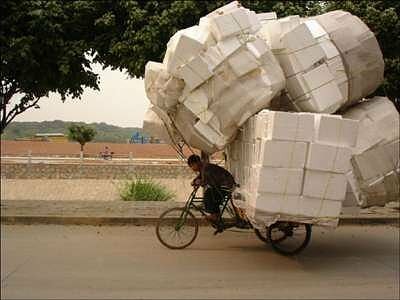 Personally I am fascinated by people carrying huge volumes and weights on a bicycle. It is an art that requires not just balancing the whole thing but also systematically loading and unloading the load in such a way that it will always be balanced. Side by side comparison of 12 front triangle bags. Side by side comparison of 12 top tube bags. Review of the Tangle frame bag from Revelate Designs, Medium and Large version. Waterproof panniers for the front and back of the bicycle. A waterproof bag to carry your laptop and other equipment to work. Stretchy straps to tie your stuff down. A capable bicycle trailer and shopping trolley in one. Get creative while hauling stuff around.